Cool! 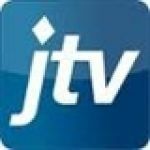 Save an average of 20% on JTV with 30 Coupon Codes, and 20 Deals! Details: Find Huge Savings When You Shop the JTV Clearance Section. Up to 60% Off, shop now. Details: Get 40% off your purchase. Expires on 02/13/2014. Details: Get 10% off any single item. Expires on 03/04/2014. $50 off. expires on 11/21/2013. Details: $50 off. Expires on 11/21/2013. Details: Get $10 off a single jewelry or gemstone item of $49 or more January 9-12, 2014.